In the Domesday Survey of 1086, Southwark was said to have only a dock, fishery and 50 houses. Towards the end of the Medieval period the area had become quite up-market and a number of wealthy individuals such as Bishops and Abbots had moved in. Despite this, during the 16th and 17th Century, Bear Gardens became well known for debauchery, being home to numerous bars and brothels. Bankside has always been a hub for entertainment. 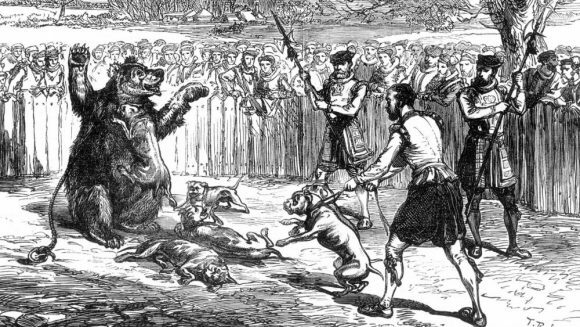 Bear Gardens gets its name from the famous ‘bear-baiting’ ring that stood here, where exotic animals were forced to fight each other as a form of violent entertainment. Luckily that all stopped in 1835! To this day theatre-goers are still attracted by the bus load thanks to the famous Shakespearean theatre The Rose and Globe theatre close by. Fast forward to Victorian times, and thanks to the industrial revolution, the Bankside area became crammed with the iconic brick warehouses and factories. It was then that the original Empire Warehouse was born. Over its lifetime spanning the 20th Century, the Empire Warehouse and its surrounding buildings became home to Victorian pattern card makers and tobacconists, to name a few. Tea traders Appleton Machin & Smiles operated in the warehouse for most of its life, giving it a lot of it’s original features that you can still see today. After the 1970s, the Empire Warehouse sat empty for decades, until we came along and breathed new life into it. We’ve restored many of it’s original features and injected charm and glamour into these unique warehouse-style apartments. Walking down quiet Bear Gardens, you won’t feel like you’re in one of London’s most visited neighbourhoods. So why not come and explore the area and find out why it’s so popular? Book your stay at Native Bankside today.